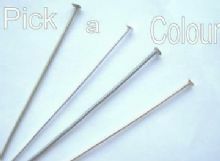 Flat head pins in 2 lengths & 4 finishes. Ball headpins, Fancy head pins. 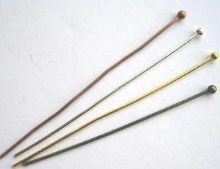 2" Headpins. 50mm. 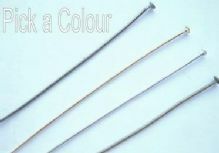 Pick a colour. 38mm headpins x 65. Pick a colour. Ball Headpins x 25. Silver, Gold, black, Antique, copper. 47.5mm - 50mm. Domed headpins x 10. Pick a style.